A cool thing about riding and writing for Snowmobile.com is the people I meet and ride with, some who are artists and masters at riding, and at times, I get to learn from them. Take Bret Rasmussen, a person who tops the list as a mountain snowmobiling master artist — but also for me, a valued friend. I wonder where our friendship would be – if any – had we not met at a snowmobile show in Rigby, Idaho in the fall of 1996. I had heard of Rasmussen because of his snowmobile dealership in Preston, Idaho, Mountain Magic Sports, his riding ability, his many championships in competitive hillclimbing, but it was not until after meeting and visiting with him I realized he was also a genuine person – a great guy. From that day on, our paths would cross many more times as Rasmussen frequently participated in our Mountain Mod riding events. This is where we learned firsthand of Rasmussen’s unique sled set up techniques, his ability to ride in the mountains, and of his easygoing personality. 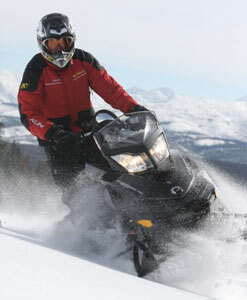 Snowmobiling is Rasmussen’s passion. You can see it in his riding and his excitement for the sport. But it is also more to him. “Snowmobiling is more than just recreation, it is what puts the meat and potatoes on my family’s table,” he said in an interview with Mountain Mod Mania. Rasmussen’s clinics provide basics in techniques and knowledge for making serious moves into the backcountry. 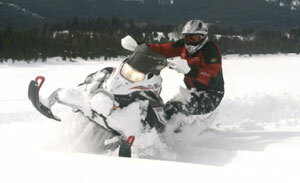 His resumé includes: numerous King of the Hill and World Championship snowmobile hillclimb titles; being an Arctic Cat dealer for 25 years; and serving as an evaluator and consultant to aftermarket performance companies for mountain sled products through his business, Snowmobile Research Services (SRS). Also listed on Rasmussen’s resumé are two other highly credible entries. One, after selling his dealership in 2006, he went on the road for Arctic Cat to manage its M series demo ride tour, and secondly, this past winter, he launched his “Ride Rasmussen Style Tech School” with the introduction of the popular video “Schooled.” Along with riding pal, Chris Burandt, Bret Rasmussen does an excellent job of demonstrating extreme technical back country riding. For those who want to learn more about technical tree running, Ride Rasmussen Style is your school. Why take a riding clinic? For you Midwest trail riders who spend time out West Mountain riding in popular mountain riding destinations, this should be an easy sell. It’s also a very good idea. Besides learning mountain riding skills you will also get lessons in necessary mountain survival skills, which include mountain sled set up, avalanche equipment, how to read the terrain and snow conditions to avoid avalanche danger, GPS navigation, and ways to free a stuck sled. There’s a great deal of basic information to know before heading west and riding the deep powder. 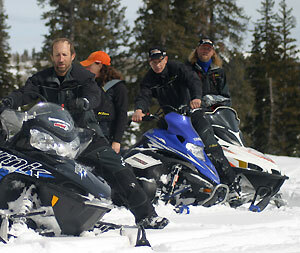 Brett Rasmussen, at left, welcomes all brands of snowmobilers to tap into his knowledge of powder riding. A tougher sell will be experienced mountain riders — the passionate mountain rider who has been riding for years and is a very good rider, the person who works on his or her own sled who has stayed through the good and the bad of lean snow years, or maybe you’re the person that has switched brands a few times following the market. You are the core of mountain riders and your passion is what keeps the sport going. So how would you benefit from personal experience at Rasmussen’s riding clinic? You can pick up some techniques developed by very talented riders. Since they were learned, they can also be taught! For example, considering myself a very good rider, I was invited on a ride with Rasmussen and Burandt who showed me a whole new style of mountain riding. It looked fun. But when I tried it recreate what they were doing, I failed miserably. I even left the group for a while to work on my own. But again, nothing! Upon returning to the group I approached Rasmussen and told him, “It’s not working for me, what do I need to do?” He took the time to explain. He showed how to put a foot in the “right” place then turn your heel out. I thought out loud, so you put the wrong foot forward? In Rasmussen’s riding clinics you will learn about the neutral position, position one, two and three. Position three being the most aggressive sidehill set up —also known as wrong foot forward. Much of his back country riding style is about simple foot and body placement. Then comes lots of practice, which brings the ability do this with less effort, which translates into less fatigue. Snowmobile.com mountain rider Kevin Allred uses techniques taught by Bret Rasmussen to shake down the latest deep powder models. One other point on taking a riding clinic: there are many aftermarket performance products that find their way on mountain sleds with the latest craze being the turbos. With today’s technology, these systems work incredibly well. If you are willing to spend the money on performance products, you should take the time and money to make an investment into yourself and you will even get more out your sled. How do you get hooked up with Rasmussen for a riding clinic? Visit his web site RideRasmussenstyle.com. There you will find everything you need, including his per day pricing for a clinic in Preston, Idaho. Since Rasmussen doesn’t care how many are in the group, you can gather up your riding buddy’s and divide the cost. We would suggest you stay two days with Rasmussen as he will have you so exhausted by noon the first day that it will all be a blur. The second day you will really perfect those riding skills. Last year Rasmussen had many bookings with individual clients who learned “Rasmussen Style” for several days. When you learn the proper techniques it still takes practice to make perfect in the powder. Rasmussen notes that the upcoming season’s spots are filling up. New for this year, he has booked a clinic in Norway. What are Rasmussen’s personal rides? For this winter season he will be riding two 2011 Arctic Cat M-8’s — one set up with a Boondocker pump gas turbo and the other one set up for race fuel along with Rasmussen’s own signature series suspension set ups. 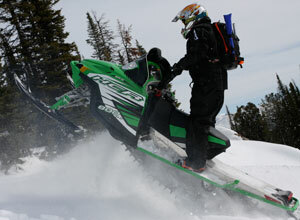 But don’t feel you have to be an Arctic Cat rider to attend the Rasmussen riding clinics, he welcomes all comers. For years Rasmussen has thrilled audiences with his unique riding style and ability to find new lines as he competed in hill climbs. Anyone who has ever ridden with him has wanted to know, how you could ride like him. Now you not only can ride with him, but you can learn from him one-on-one.